Long live the queen. She can be seen at the bottom of this photo. Marie Vilà started and ended her first year of beekeeping with a queen. 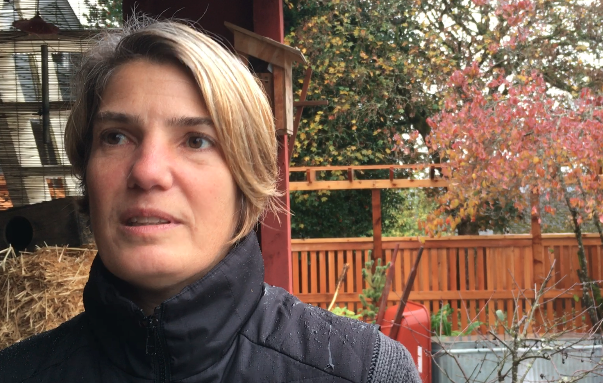 The West Bremerton resident decided to join a growing number of urban Americans in trying her hand at raising her own colony. You’ve probably read stories about Colony collapse disorder and how insecticides are impacting wild bee populations. The good news is honey-producing bee populations appear to be stabilizing after a period of decline. And it may be people like Vilà that are helping make that happen. But her first year included triumphs and tragedies. Her queen bee, capable of living years, survived. Sadly, her once-robust hive did not. Here’s what happened. She started by taking a master bee-keeping class in the spring, aided by the West Sound Beekeepers Association. She bought what’s known as a langstroth style of hive and put it atop her carport. For about $120, she got a pound of bees from a California almond farm. 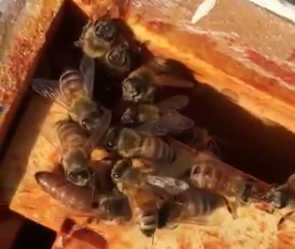 Her queen bee was separated from the hive so they can adjust to each other’s smells (and the hive does not revolt). Once ready, a cork keeping queen and the bees apart is replaced with a sugary marshmallow that’s eaten through. And voila — the hive is united. Vilà said summer was amazing. The bees were abundant and the hive productive, growing to 50,000. She started noticing the pears of her garden, in particular, were growing spectacularly with their newfound pollinators. The bees were producing great volumes of honey, too, important to help the hive survive the winter. Then, something happened: the bees began dying off. At first, Vilà assumed some of it was just natural — after all, bees don’t live too long. But fewer and fewer were left to protect their queen. Until one day, all that was left was the queen. Vilà suspects the bees were infected with a Varroa mite, an unfortunate but all too common cause of death. She did the only thing she could — bundled up her queen and whisked her to the West Sound Beekeeper’s Apiary. “She was on her last legs,” Vilà said. The queen is surviving there, she said. The queen can live with another hive, which can support her for now, though she must remain isolated from them for fear they would attack her. Queens can live up to a few years and Vilà’s hopeful that in spring, she can get new bees acclimated to her own queen again. I’ll be sure to provide an update on Vilà’s efforts next spring, as she attempts to build a new hive with her tried and true queen.